Dieser Grand Canyon-Tagesausflug von Flagstaff oder Sedona aus ist auf maximal 14 Personen begrenzt. So können Sie ein noch persönlicheres Grand Canyon-Erlebnis genießen. Während Ihres Rundgangs erfahren Sie von Ihrem erfahrenen Guide mehr über die Geschichte Arizonas, Archäologie, Geologie sowie Flora und Fauna. Die Tour verbindet antike Ruinen, Lavafelder, majestätische Vulkane und eine atemberaubende Aussicht auf den Grand Canyon National Park und die bemerkenswerte Painted Desert. Zu den Highlights zählen eine Fahrt entlang des Grand Canyon South Rim und East Rim. Besuche des Sunset Crater Volcano National Monument und des Wupatki National Monument; und ein Mittagessen im Südwesten in einem historischen Navajo-Reservat. 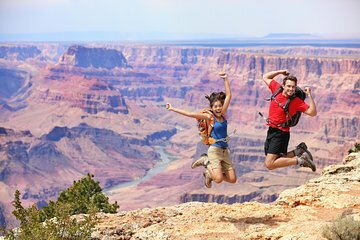 Genießen Sie den Eintritt in den Grand Canyon durch ein weniger bekanntes Tor mit einer überdurchschnittlich kleinen Reisegruppe. 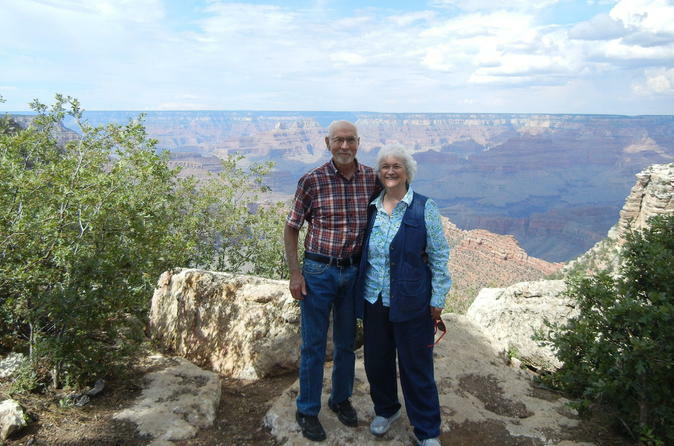 Diese Tour umfasst viele Gebiete im und rund um den Grand Canyon National Park. Eine frühe Abholung von Ihrem Flagstaff- oder Seodna-Hotel ist der Start für Ihren Tag mit einem Minibus. Das Wupatki National Monument ist Ihre erste große Haltestelle. Wie Ihr Reiseleiter erklären wird, lebte die alte Kultur der Ureinwohner Amerikas in Sinagua 400 Jahre lang hier. Dann alte Wüstenbewohner. Zeuge des dramatischen Ausbruchs des Sunset Crater Volcano vor fast einem Jahrtausend, bei dem die Häuser zerstört und vertrieben wurden. Ihre Tour beinhaltet einen Besuch der Lavafelder am Sunset Crater Volcano National Monument. Machen Sie eine Pause von der Tour mit einer Mittagspause in der historischen Cameron Trading Post. Auffallend ist der Blick auf die Little Colorado River Gorge von Deck aus. Nach dem Mittagessen besteigen Sie Ihren Mini-Bus und erkunden den Grand Canyon für einen Nachmittag, um dieses wunderbare Naturwunder zu erkunden. Sie halten an Aussichtspunkten am East Rim und South Room der Schlucht, um dramatische Schluchten von unten zu sehen. Sie haben Zeit zur freien Verfügung, um in Ihrem eigenen Tempo auf eigene Faust zu erkunden. Während Ihres gesamten Tages, egal ob Sie zu Fuß oder mit dem Mini-Bus unterwegs sind, werden Sie von Ihrem erfahrenen Guide in die Geschichte, Archäologie, Geologie und Flora und Fauna des Grand Canyon und der Umgebung eingewiesen. Mark, our driver and guide did an excellent job. He tailored the trip to the age and needs of the guests. Very knowledgeable, polite, and responsive. We were so lucky to have Sheldon as our tour guide. He took us to see so many incredible sites, from volcanoes, to ruins to 6 different view points of the Grand Canyon with spectacular views! Sheldon went above and beyond and made the day special and memorable! We truly enjoyed our Ultimate Grand Canyon Day Trip from Sedona. Our guide (JR) was so entertaining and knowledgeable about the area (Sedona, Flagstaff, and the Canyon area). He took us to the best areas around the canyon and we were able to walk out to areas to get the best view possible under his guidance. One of the best stops was the Lava flow where we met a dinosaur named Larry. With JR's help, each member of the group got to have a great photo opt with Larry (JR used his movie background to make it happen). Great lunch at the Navajo Trading post and reservation was include. We enjoyed the group we were traveling with (ten people in the group). Got a chance to get to know each other and make new acquaintances. Highly recommend, well worth the money. The trip to the Grand Canyon was phenomenal. The Navajo Reservation was breathtaking, especially the views. Our tour guide, Ezra, was very knowledgeable and very helpful the entire trip. I would recommend this tour to anyone seeing the Grand Canyon for the first time. Very nice tour and highly recommend Pick us up at our hotel and was punctual. Very knowledgeable driver/tour guide, one of the best I experienced I think seven different events toured all a significant distance between them so lots of windshield time. We really enjoyed our Grand Canyon tour. It was a full day tour with lots of stops and adequate time at each for photos, shopping and a little exploring. We also had a really nice lunch at a very unique place called Cameron Trading Post. It’s a large gift shop and restaurant. The gift shop has a very good selection of Native American made art, jewelry, pottery a handmade Navajo rugs. There was even a woman there weaving them onsite. The restaurant was really good and we ordered off a special menu for tour groups, My friend and I both had the Navajo taco which was excellent and we had a bit of time to shop also. The tour had stops at the Wupatki National Monument ruins, Marble Canyon, Navajo Point and the South Rim of the Grand Canyon. Our tour guide, Rasa was a walking encyclopedia and was eager to share all of his knowledge of the areas we visited. He was very personable, funny and made the day seem to fly by. Even during our travel time between sites he told stories about the history of the area and local lore. I highly recommend this well organized, fun and interesting tour. Excellent and very informative. Great Guide. Rasa was very helpful .Food was a new experience for us and we loved it. What a spectacular tour...it was our first trip to the Grand Canyon, and it truly exceeded our expectations. Nothing can prepare you for the views, the sheer magnificence. Riding in a little tour bus is not ideal, but even that wasn't terrible. It's a long day, and a lot of driving, but there is so much to see, and in my opinion, the most efficient way to take in as much as possible in a short time.Regarding the guide, I wouldn't step back on a bus with Kevin ever again. While he was knowledgeable, he was unbearable. He came across smug and condescending. His refusal to use a microphone led to him shouting information across the bus for the whole tour. He had no respect for time, and we arrived back 2 hours later than expected, which made for a long, exhausting drive to our next stop, in the middle of the night. To sum up, I highly recommend the tour. Just ask for anyone BUT Kevin. Excellent tour!! JR, our driver and tour guide, was awesome! He was a wealth of information! His knowledge of the area was outstanding!! Would highly recommend this tour!